58th NCT update and the last Confederate soldier from North Carolina. Well, I finished chapter four last week, and I'm well into chapter five. The regiment has finally gotten out of the mountains and is inJohnson's Depot (now Johnson City), Tennessee. With the death in Los Angeles of Capt. Alden G. Howell, native ofHaywood County, there are only six Confederate veterans left in North Carolina. Captain Howell was believed to have been the only surviving commissioned officer in the Confederate Army. The six remaining veteran members of the N. C. State Troops are G. W.Dickerson of Buncombe County, who served in Capt. Walter Bryson's Company; R. V. Collie of Franklin, Co. A, First Regiment; G. W. Benson, Mecklenburg, Co. H, 26th Regiment; Charles S. Riggan, Warren, Co. B, 39th Regiment; A. S. Cockerham, Surry, Co. F, 33rd Regiment; and S. M.Bennett of Yancey, member of the Black Mountain Regiment. Only one body servant still lives in the state. He is Alfred Blackburn of Yadkin, who was with Capt. Blackburn. The men draw a $72 monthly pension from the State. 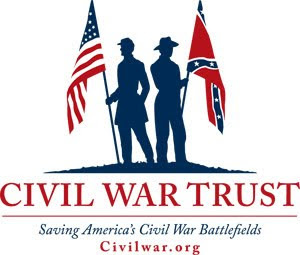 The 21 remaining widows of Confederate veterans who are not incapacitated draw $18.33. There are 502 widows who are disabled, and they receive a pension of $35monthly. Most people recognize S. M. Bennett, a.k.a., Samuel Bennett, as the last remaining Tar Heel soldier. He died in 1951. But there seem to be alot of holes in Bennett's story. He is listed, according to a pension record, as serving in Company K, 58th North Carolina Troops. The last surviving North Carolina Confederate Army veteran died in the mountains of Yancey County on Mar. 8, 1951. He was 100 years old. Samuel E. Bennett, age 13, enlisted in the Black Mountain Regiment of the Confederate Home Guards along with his grandfather and four unclesin 1864. Pvt. Bennett was wounded in a dynamite blast while digging trenches near Richmond, VA, but recovered and served until the war ending in1865. He was mustered out at the age of 14. As many of you who have followed this blog along know, the 58th NCT was not digging trenches at Petersburg. They might have been digging trenches around Atlanta, but not Petersburg. Also, there was not a"Black Mountain Regiment." 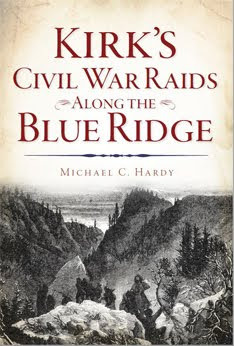 The writer was probably referring to the"Black Mountain Boys," i.e., Company C, 16th North Carolina Troops, in which Sam Bennett did have numerous relatives. I thought that I had a copy of an article discussing the problems with the Sam Bennett story, but I can not seem to locate it. If anyone has a copy of this article, could you drop me a line? Your writing of the missing state flag for the 37th North Carolina compels me to ask about another of the regiment's apparently missing banners - the 1863 Richmond Depot issue with the blue battle honors. Mr. Glenn Dedmondt's The Flags of Civil War North Carolina doesn't mention such a banner existing. Yet, his book does confirm that each of Lane's other four regiments had carried such a flag. The only regimental standard discussed for the 37th North Carolina is the earlier issued Branch/Lane brigade banner. I’ve given this subject matter a lot of thought and some debate. I usually get shot down on the debate end. But hey, what would the world be without a little debate. 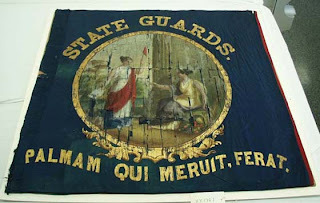 The 7th Regiment North Carolina State Troops received this flag as part of the June 1863 distribution of 3rd (bunting) issue flags to A. P. Hill’s Light Division. Dedmondt goes on to say the same thing about flags issued to the 18th, 28th, and 33rd, but not the 37th. And please don’t misunderstand me, I’m not picking on Dedmondt. Others have said this; I just happen to have Dedmondt’s book here on my desk. So, did the 37th NCT get one of these flags? You would think, that had this been a wholesale flag issue to the regiments in the Light Division, that there would be some mention of the 37th NCT’s flag. But alas, no mention what-so-ever of the flag being issued to the 37th NCT. Furthermore, there appears to be no record of another flag ever being issued to the 37th NCT. It would seem that they carried their December 1862 for the rest of the war, until it was captured on April 2, 1865, just outside of Petersburg. Now for the problems. I’ll start with the 37th. I’ve spent considerable time standing in front of the display case (when at Pamplin Park) looking at the 37th NCT’s flag. While I know that the flag has been restored, it is still in remarkable shape for a flag that belonged to one of the hardest fighting regiments in the ANV. That flag would have seen the whistle of balls and the shriek of cannon at Fredericksburg, Chancellorsville, Gettysburg, Mine Run, the Wilderness, Spotsylvania, North Anna, Cold Harbor, and a host of the battle during the Petersburg Campaign. While some patching of the flag is evident, one would think that it would be shot to shreds. So, based upon this simple observation, I would think that there would be another 37th NCT battle flag out there somewhere. Maybe it was captured and some Yank took it home as a souvenir, or maybe it was taken home by a member of the regiment, or maybe it was tied to a rock and dumped into a river on the retreat. Now for more problem with the flag of the 7th NCST captured at Gettysburg. Why does the flag issued to the 7th NCST and supposedly captured at Gettysburg have both the "Wilderness" and "Chancellorsville" painted on it? Some folks say that this represents two different actions during the battle of Chancellorsville. But why do none of the other regiments in A. P. Hill’s Division, who were involved in the same actions at Chancellorsville, have this same arrangement of battle honors? Why is it that the 7th NCST was carrying this flag, while the 28th NCT was carrying their flag with the white battle honors, which they also lost on July 3. 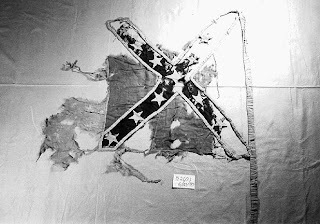 Is it possible that the flag of the 7th NCST captured at Gettysburg was also their first issued battle flag, of which only a fragment survives? Is it possible that the flag always attributed to being captured on day 3 was captured at a later date and mis-identified as the flag captured at Gettysburg? Well, there we have it. As I said earlier, what’s the world without a little debate? Maybe some day I’ll post the reasons why Lee chose Wilcox over Lane to command the Light Division. No, it has nothing to do with Jackson. Keith - I enjoyed the article in Gettysburg Magazine (Issue 37). As a side note, the brigade arrangement on page 119 is not correct. It was the 7th North Carolina and five companies of the 37th that broke away from the rest of the brigade. Also, the email you sent me some time ago, got accidently deleted the day after you sent it. I would love to talk to you more. 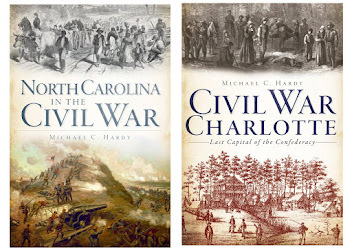 When local historian Chris Watford decided to take a closer look into Davidson County’s Civil War history in 2003, the multi-state Civil War Trail program hadn’t yet expanded into central North Carolina. Within two years, the first two Davidson County markers on the trail were dedicated in Thomasville. A third in the Chair City followed in March of this year, commemorating a field hospital that treated union and confederate soldiers wounded in the Battle of Bentonville in Johnston County. On Saturday, Watford, alongside tourism and history museum officials, unveiled two new markers in Lexington with a third to follow Sunday at Lake Thom-A-Lex. For Watford, the unveilings of the county’s fourth, fifth and sixth markers were a recognition of the role local people played in a pivotal moment in U.S. history. “I came to realize, as a historian and a history buff, that these were some great stories that needed to be told,” Watford said. The Saturday unveilings were performed amid a living history event that helped tell the story of the Union occupation of Lexington in the late spring and summer of 1865, when Maj. Gen. Judson Kilpatrick took up residence in The Homestead on South Main Street, a private residence owned by Dr. William R. Holt. The doctor was away at the time of Kilpatrick’s arrival, securing his plantation, Linwood, against the threat of raiders. Holt’s wife, Louisa, offered up The Homestead to Kilpatrick upon his arrival in Lexington to prevent it from being taken by force, something she feared might place her family in danger. After Kilpatrick set up his command at The Homestead, the Ninth Pennsylvania Cavalry arrived in Lexington and took up residence at the Old Court House on the Square. The Union forces would remain in Lexington through July 1865. The Union’s attraction to the two sites is understandable: The Old Court House was just as striking a presence in that era as it is today, and The Homestead was widely regarded as the most impressive house in the city at the time. “In May of 1865, these were two of the most prominent landmarks in Lexington,” Watford said. On Saturday, reenactors from the 26th and 27th North Carolina stepped momentarily out of character, donning blue Union uniforms to portray the Ninth Pennsylvania Cavalry in a living history event hosted in cooperation with the county’s Tourism Recreation Investment Partnership and the Davidson County Historical Museum. The regiment hosted “School of the Soldier” demonstrations, showing those in attendance the training exercises a newly enlisted man in the Civil War era would have undergone. “It was part of the training that the men went through to learn to operate as a cohesive unit in battle,” said Capt. Dennis Brooks of the 26th North Carolina. Sgt. Clint Johnson, also of the 26th, said these types of events can be illuminating for smaller towns not commonly thought of as Civil War hot spots. “It gives the citizens a chance to realize that history happened in their town,” he said. To aid in that realization, the Davidson County Historical Museum opened its exhibit, “Marking the Trail of Our Civil War History,” featuring artifacts on loan from local ancestors of Civil War soldiers. Those items range from rifles and sabers to a wooden leg that once belonged to a local confederate soldier, Lindsay Lemuel Conrad, on whose land along Abbotts Creek, near modern-day Lake Thom-A-Lex, Confederate President Jefferson Davis camped in April 1865. That occurrence was noted on the Civil War marker at the lake Sunday afternoon.Museum curator Catherine Hoffmann said the exhibit focuses on the events of all six Davidson County markers.“We’re using these objects as triggers to discuss what visitors are interested in,” Hoffmann said. With six markers on the Civil War Trail now firmly established in the county, Watford has his sights set on more official recognition for local historic sites. The two that were unveiled Saturday, he said, were made possible by years of concern for local landmarks by area residents. “These sites were preserved not only throughout the federal occupation but by the care and concern of the people of Lexington,” Watford said. Chris Graham sent me an email with the accession number for the remnants of the flag of the 17th North Carolina - thanks Chris! I’m not sure why my searches did not produce this. Maybe the internet fairies were not with me??? Where have all of the flags gone? I had an email this evening from Russ Lane, a descendant of a member of the 17th NCT. He was asking about the battle flag of the 17th NCT. I pulled out Glenn Dedmondt’s The Flags of Civil War North Carolina and flipped to the page with a drawing of the Second National carried by the 17th NCT. Dedmondt’s book is considered the standard reference source on the subject. I like the book. However, it lacks a lot. The information for the flag of the 17th NCT says that "There is little left of the 2nd National flag used by the 17th Regiment. The tattered remains are 55" along the hoist. The flag was hidden by Pvt. Able Thomas and taken home with him after the surrender." I want more. When was the flag made? When was it issued? Was Thomas the regimental color bearer? What battles did the flag see? When was it donated to the Museum of History in Raleigh? I went to the Museum of History’s web page, but the flag was not listed in the artifacts search. I did find reference to the flag of the Pasquotank Guards, which would become Company L, 17th NCT. This flag, a fragment of which is pictured here, is not mentioned in Dedmont’s book. All of this leads me to this: we need a detailed history of North Carolina’s war-time flags. I’ll give you three questions that I’ve yet been able to find an answer to. Maybe this will help uncover some more material. One. Did the 37th NCT get a state issued flag, where is it, and what flag did the 37th NCT carry between November 1861 and December 1862, when they were issued the ANV battle flag with the white battle honors? Two: Did the 58th NCT get a state issue flag and what happened to it? Three: Were the 2nd and 3rd North Carolina Mounted Volunteers (US) issued flags and what became of them after the war? I know that researching flags is not easy. I’ve researched these two regiments for a decade, and I’ve written about the 37th NCT, and I am currently working on a book about the 58th NCT. I understand how important a flag was to the men in a regiment. I just wish we had some more material concerning flags. Well, I’m in the middle of a very busy week. I had the book signing Sunday in Lenoir. I had another last night in Clyde (Haywood County), then rushed back over to Burnsville to talk with Terrell Garren, author of Mountain Myth: Unionism in Western North Carolina. 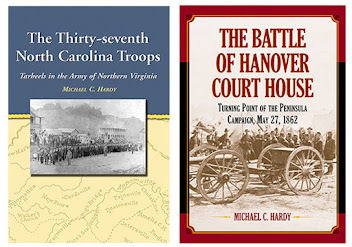 Tomorrow, I’ve got a book signing at the Banner House Museum in Banner Elk. Friday, I’ll be speaking at the Carolina Mountains Literary Festival in Burnsville, then I’m off to the Brown Mountain lights Festival in Linville Falls. On Saturday morning, I’m off to the Cove Creek Heritage Festival in Watauga County, before heading back to Burnsville. On Sunday, there is a decoration service at the old Bakersville Cemetery. In 58th news, I’m still plugging away at chapter 4. Did you know that Company K was made up of men primarily from Companies A and E? I’ve not come across a good reason yet - maybe they were dissatisfied with their company commanders. Or, maybe the Company K commanders saw an opportunity for advancement. Or ? Yesterday, I had the opportunity to sign books at the open house of the Caldwell Heritage Museum in Lenoir. While I was there, John Hawkins, director of the museum, showed me his new book, Wars and Rumors of War. 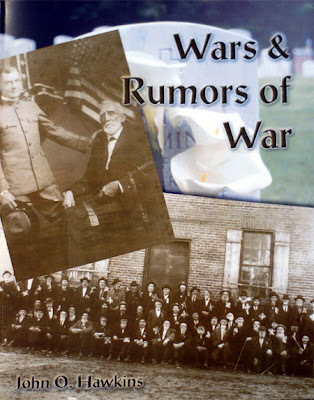 John has been writing history-related articles for his local newspaper since 1990, and Wars and Rumors of War is a collection of articles relating to the military and Caldwell County. All time periods of the service are included in this new book, from the American Revolution to Operation Desert Storm. For the War Between the States afficionado, countless stories abound of Gettysburg and Stoneman’s raid. Many of these stories are from the actual participants. At least half of this book is about the war. 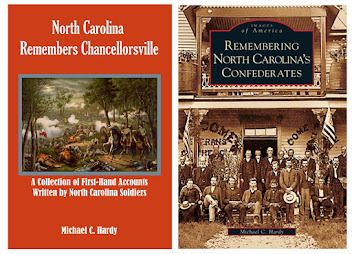 If you are interested in a copy of the book, please contact the museum at 828.758.4004 or visit their web page. While I was there I mentioned to John about having the Museum and/or the historical society sponsor a Round Table discussion much like the Yancey County one that we did last week. He liked the idea, and we are hoping to put this together next spring. Harnett County News EditorBryan Avery says history is one of his passions, so when he heard about a discarded cemetery lost in the woods near the Averasboro Battleground, his interest was roused. Mr. Avery went to work learning about the heritage of the area and is now working to clean up the burial plots of some of the area's first settlers. The Norris Family Cemetery appears, from a distance, to be part of a wooded area near what history students and lovers know as Averasboro. Down a dirt road, away from regular traffic, visitors to the cemetery are rare. A closer look reveals the work Mr. Avery and other local history buffs working with him have done. Tombstones, some as old as 200 years, now rise into an area which will soon have the appearance it deserves. Mounds in the ground mark where other bodies may lie. The exact number of those buried here is unknown. "There are 90 recorded markers and there could be a lot more," Mr. Avery said. The identified graves include those of soldiers, family members and others, and Mr. Avery said. He said the oldest of the people buried here were born in the 1750s. Mr. Avery said he first learned of the cemetery when reading about the history of the old village of Averasboro, which sits south of Erwin. It was there that brave Confederates soldiers offered some of the only resistance to the destructive forces of Gen. William T. Sherman in the waning days of the Civil War. Mr. Avery began an investigation and learned more about the burial plot from Wade Hampton West, who has lived nearby all his life. Mr. West is a living history book of the area, and is named after Confederate War hero Wade Hampton. He eagerly offered exact burial spots of individual Confederate soldiers. Mr. Avery said once he was made aware of the situation involving the historic burial site, he felt he needed to do something. "The history of Harnett County is right here," he said. "We love history and that is what everything we do is about." Mr. Avery plans to provide many more people the chance to see the cemetery. He and friend Bill Faircloth have spent numerous days, including several Saturdays, with power equipment and hard labor to clear the area. When they started, most of the graves were hidden by hundreds of years of debris and dirt. Now the names of the graves' occupants are clearly visible. Some of them have rested in the ground since the days of the Revolutionary War. Rows between the graves that were once cluttered are now being cleared, offering easy access. A new fence will soon replace trees as the boundaries of the area. Mr. West looks on the project with a smile. He is now slowed by age but still eagerly seeks out locations he has known most of his life. His parents and grandparents have lived in the area since the Civil War. He is overwhelmed to see the work Mr. Avery and Mr. Faircloth are doing. "This is something I have wanted to see for a long time," Mr. West said. "This is where I grew up and I want to see it look better." Yancey County program last night. 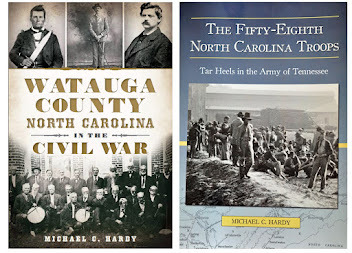 Last night, we had a Yancey County and the Civil War discussion at the public library in Burnsville. Talking about the war is one of my greatest joys. And, for a little over two hours, that's all we did. The topics ranged from Longstreet, Lee, and Stuart at Gettysburg; to A.P. Hill, Braxton Bragg, Nathan Bedford Forrest, the role of cavalry during the war, and a host of other topics. The questions and answers came as fast as they could with not much down time. Seventeen people were on hand. As I said, spending two hours with a group of fine folks just talking about the war is a great way to spend a couple of hours. The Civil War Trails marker program here in Avery County is proceeding slowly. I did meet with a couple of folks on Friday. Hopefully, I'll have something to report on soon. I'm also working with some folks (Cheryl Richardson) on getting a section of the Old Turnpike Road in Avery County designated a scenic by-way. This is part of a road used by Federal soldiers escaping from Salisbury and heading into east Tennessee during the war. Civil War preservation and interest is alive and well in Western NC! Greetings folks! Though I would share with you this event that I am participating in this Tuesday. 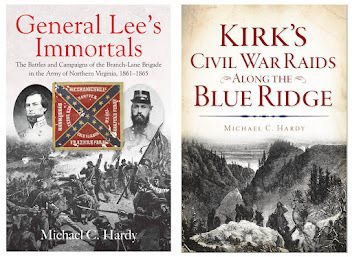 Do you have an ancestor who served in the Confederate or Union army? Want to know what happened on Jack’s Creek or in Burnsville during the War of Northern Aggression? What did the men who marched away in 1861 and 1862 do? Were they at Gettysburg? Chickamauga? Bentonville? Appomattox? 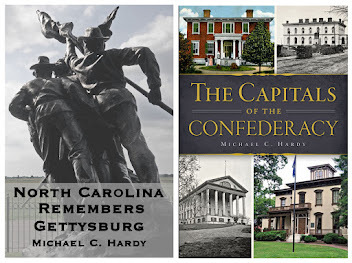 Join a group of local historians on Tuesday, September 4, at 6:30 pm, at the Yancey County Public Library Annex as we discuss the both Yancey County and the War for Southern Independence, and the role that Yancey County men played in many far off places. This event is free, and the public is invited to attend. Please bring a friend and all of those questions about the Civil War that you never knew whom to ask. For more information, please contact Michael Ledford at (828) 682-9151.